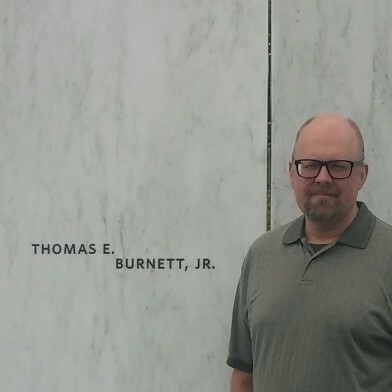 Paying homage to Minnesota native Thomas Burnett, Jr. on the 17-year anniversary of the September 11th terrorist attacks on U.S. soil. At the Flight 93 National Memorial in Stoystown, PA, circa 2017. Tom was one of 40 passengers and crew members on United flight 93 on 9/11/01. This particular flight was noteworthy in that the passengers, knowing what had happened to the World Trade Center earlier that morning, decided to thwart further carnage by overtaking the hijackers in the cockpit. The flight ended up crashing in an abandoned field in rural Pennsylvania, approximately 20 minutes flight time from its intended target of the Capitol building in Washington, D.C. (Here is a transcript of Tom's final call to his wife Deena). We often recall the heroic acts of law enforcement officials and fire fighters who rushed into the Twin Towers to perform rescue efforts, knowing full well they may not make it out alive. However, the passengers of United 93 conceded that they certainly would perish, but they were damn sure not going to allow any additional deaths on their watch. It's safe to say they too showed remarkable heroism.